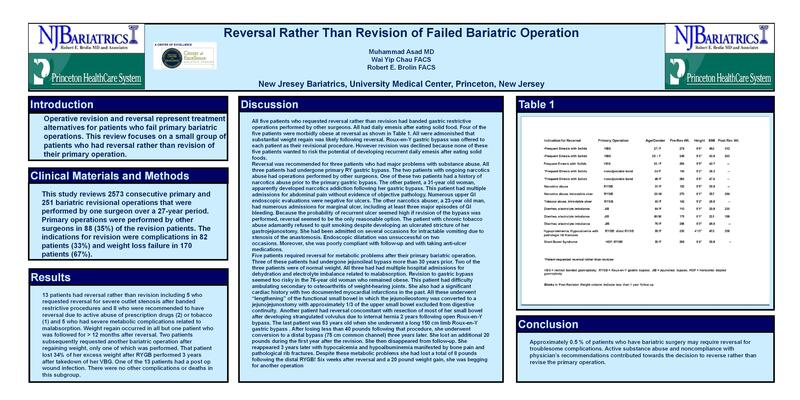 Operative revision and reversal represent treatment alternatives for patients who fail primary bariatric operations. This review focuses on a small group of patients who had reversal rather than revision of their primary operation. METHODS: This study reviews 2532 primary and 238 revisional operations that were performed by one surgeon over a 27-year period. Primary operations were performed by other surgeons in 75 of the revision patients. The indications for revision were complications in 73 patients (31%) and weight loss failure in 165 patients (69%). RESULTS: Ten patients had reversal rather than revision including 5 who requested reversal for severe outlet stenosis after banded restrictive procedures and 5 who were recommended to have reversal due to active abuse of prescription drugs (2) or tobacco (1) and 2 with severe metabolic complications related to malabsorption. Weight regain occurred in all but one patient who was followed for > 12 months. Two patients subsequently requested another bariatric operation after regaining weight, only one of which was performed with	34 % EWL post revision. One of the 10 patients had a post operative wound infection. There were no other complications or deaths in this subgroup. CONCLUSIONS: Approximately 1.0% of patients who have bariatric surgery will require reversal for troublesome complications. Active substance abuse and non-Compliance with physician’s recommendations contributed towards the decision to reverse rather than revise the primary operation.